Plaza Villa is a beautifully acquainted 3 bedroom/ 2 bathroom furnished rental condo located within walking distance of Kierland Commons Shopping in North Scottsdale. This is a gated community with great amenities such as heated pool, hot-tub, gym, movie theatre, business center, and more all located within minutes of everything Scottsdale has to offer. You will be pleasantly surprised with the coziness of the décor interior finishing's. There is a king bed in the master suite with LCD wall mounted TV and a large master bathroom. The second bedroom also has a king bed with mounted TV and the third bedroom has 2 twins. The living area is complete with a sectional sofa and flat screen TV mounted above the wood burning fireplace. This Scottsdale Vacation Rental is a perfect choice for your Arizona Vacation. We are a 5 minute walk to the amazing Kierland Commons and new Scottsdale Quarter. The best shopping, theatres and restaurants (Dominick's Steakhouse, Eddie V's, True Food, North, Grimaldis Pizzaria, Brio, PF Changs, The Cheesecake Factory, The Ocean Club and Sushi RA just to name a few). Kierland Golf Course within walking distance, and the famous TPC course just minutes away by car. Vacation Rentals: If this is the first time using a Vacation Rentals in place of a Hotel/Resort you are in for a treat. Your Scottsdale Rental Home will be cleaned and managed to hotel standards. In most cases we conduct a personal check in at the property to make you and your group comfortable about finding your way around the home. Somebody will be on call during your stay to answer questions or to solve any unforeseen issues. Scottsdale home rentals have become a very popular alternative to expensive resorts in the area and we are confident you will have a memorable stay with us. ***PLEASE NOTE-No late check-ins allowed at this property as your property manager has to physically let you in the gate the 1st time to the complex. Any arrival after 10pm is not allowed. We stayed a month in this condo and found the location wonderful. We found the condo could have been better cleaned. We found a dead scorpion in our closet light and the condo didn't have screens on the windows so we couldn't open the windows. The oven was extremely dirty and couldn't cook in this condo.We were extremely disappointed. Frank was very helpful and kind and helped make our stay really wonderful. The condo was well equipped, clean and within walking distance to many restaurants and activities. The condo is in a good location. We found it to be very clean. However there were some problems. The owner was not there to meet us at the agreed upon time and we waited in 115 degree heat for almost 2 hours before he responded to us. The dining table chairs are not high quality and sag so that sitting in the chairs is very uncomfortable. The large king size beds sag and need replacing. My first attempt to use the toiled I discovered only one toilet had any toilet paper and it was almost gone with no replacement toilet paper to be found. Finally the ceiling fan in the main area did not work. Excellent! The condo was beautiful. The amenities were great and the location for us was perfect. People we meet that lived in the complex were so nice and welcoming it felt like we lived there! Myles was so helpful with booking and extremely quick in responding to my questions...I have nothing negative to say and hope the condo will be available again next year! The whole experience was top notch. We had Prompt and Professional service from start to finish. The meet and greet / property run through was excellent and they were in contact with me as soon as I let them know we had landed. We chose this location because of the close proximity to the Kierland Commons and Scottsdale Quarter. We chose this condo within the property because of its close proximity to the pool and on site amenities. There is an office center, billiards room, event kitchen, two conference rooms and a theater room that are steps away. In short we have nothing but praise for the whole deal. We were traveling with 2 couples but with the extra bedroom with 2 more beds and the large couch, we could have made 2 family's of 4 work. We were only in town for 4 night to enjoy the Pink Concert. Uber was awesome as there are so many cars drawn to that area but if your into a short walk (2 blocks) the commons and quarter have an abundance of restaurants and the Famous Ipic, full service luxury Theater. There is a ton of shopping options as well. Dinner and a Movie or a drink or two make having this property so close really attractive as you don't need to drive as its so close to home. Good job. The rental experience was outstanding and professional. The communication was easy, and the rental agent was accessible and responsive. The condo unit was updated with high end and new materials and furniture. The unit was well equipped and spotless. The kitchen was fully stocked, and one could easily cook meals “at home”, if desired. The condo village was manicured, and the pool/spa/workout center was very nice and close by. The grounds and pool area were spotless, and the complex was excellently maintained. 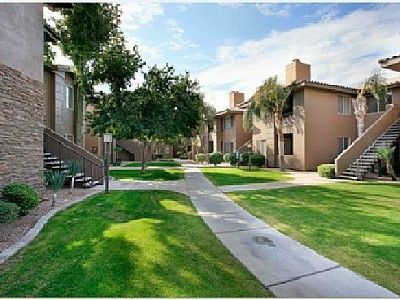 The condo is set in prime North Scottsdale/Kierland location, and is an easy walk to all that Kierland Commons has to offer. It is closely accessible to main highways, yet tucked away and quiet and peaceful. We are a 5 minute walk to the amazing Kierland Commons and new Scottsdale Quarter. The best shopping, theatres and restaurants (Dominick's Steakhouse, Eddie V's, True Food, Stigray Sushi, North, Grimaldis Pizzaria, Brio, PF Changs, The Cheesecake Factory, The Ocean Club and Sushi RA just to name a few). Kierland Golf Course within walking distance, and the famous TPC course just minutes away by car. Rates do not include a 5% Reservation Fee, 1 time Cleaning Fee & a Refundable Security Deposit returned within 7 days of departure. You can get an exact rate quote and price breakdown on this page. We accept Visa, MasterCard, Discover, American Express & Electronic Check at no additional costs. We reserve the right the change prices anytime. 25% of total due upon reservation confirmation 75% of total due 30 days from arrival If booking within 30 days of arrival, 100% due upon booking Refundable security deposit returned within 7 days of departure Please note - OUR RATES & AVAILABILITY IS ALWAYS EXACT AND UP TO DATE ONLINE! Cancellations made 30 days or more prior to arrival date will be charged a 25% cancellation fee of the total Gross Rent for the reservation, plus 100% of the Reservation Fee. Cancellations made thirty (30) days or fewer prior to arrival will forfeit all monies paid minus the security deposit and cleaning fee, and any pool heating fees paid. NO refunds for early departures.